I just settled down in Melaka. Will trying to pick up with my updates. 🙂 Sorry for the wait. I always like to watch Lion dance ever since I was a child especially those who play it so real by mimicking the actions of a real one. I remembered I ever watched this lion dance performance where the lion groomed itself like how a real cat. Posted on February 23, 2010 by Jian Akiraceo. This entry was posted in Festive Season and tagged Chinese new year, Lion dance. Bookmark the permalink. That last one is so cute. 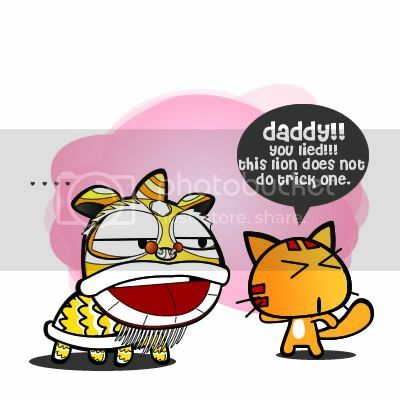 hahahah..
Hahaha so funny Uncle Miao kenak “nom-ed” by lion. Kuching not much people doing lion dance meh? Miri still got quite a lot, schools and parties one. Nowadays they won’t let go the chance to “rebut” money. 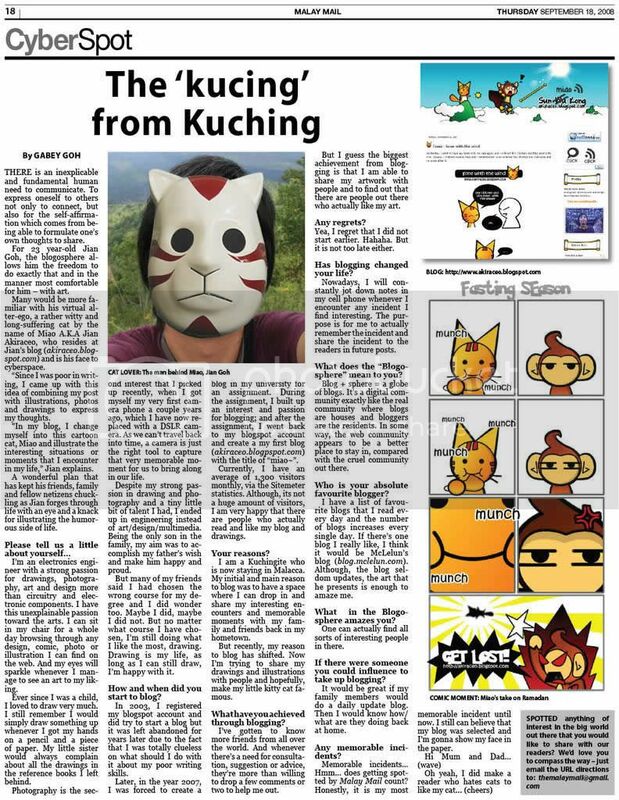 kuching not much lion dance aR? but i scared / dont like lion dance since i am small one. Not much people hiring one..
🙁 Sad.. sounds like it gonna extinct soon..
how long did you take to draw the lion? Lion meets cat lol. I think the lion dance standard seems to have dropped compared to last time. Now just shake here shake there jump grab the angpao and spit out orange on table then gao dim. All less than 5 mins @@. Especially the one in my banner.. Ever since I move to a new place, less tung tung chang. 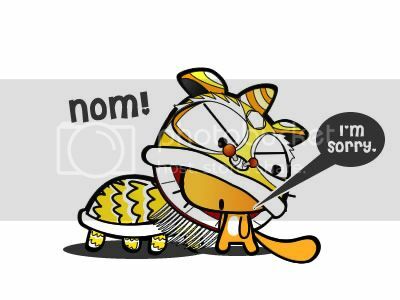 welcome back miao… me lari kao kao if got lion dance.. scare..
wait.. animal bully animal can call? Wasn’t able to watch lion dance this year too. Although I’m not a big fan of it, still felt kind of weird not watching it during CNY. Feel like missing something right? Hey yo there! i came over from Jacquelyn’s blog…and damn. u ARE good at illustrations. keep it goin dude! sekarang ini group lion dance sedang perform dari kelas ke kelas di sekolah saya – smk chung hua miri. dong! dong! chiang! seluruh sekolah. meriah ooo! Oh my goodness!!! This post is so freaking cute!!! hahaha… the noming is so cute. Teach the lion dance lions how to dance bopeep! how how to make it more interesting? hahaha..LOL-ed at the last pic. NOM. sekali gus visit all ur blog post..too busy on facebook. lolz. my ex high scl always have many lion dance teams but sadly i heard this year is way too less people participate in. it’s sad case that youngster are not into this anymore. Youngsters nowadays more to internet stuffs jor. Lemme add. Stuff firecracker in its rear. That would be fun xD. Hello. My friend and I were having a small disagreement over whether or not the lion has a shell on it’s back. I said it was the weird fur thing on lion dance costumes. Is it not the weird fur thing? It’s not a shell. It’s fur. just that my drawing didn’t show how fluffy it is lol.